Everybody wants to connect, but not everybody knows how to. Connecting is all about your friendliness, your ability to engage, and your willingness to give value first. When you combine those three attributes, you will have uncovered the secret of powerful connections and rich relationships. 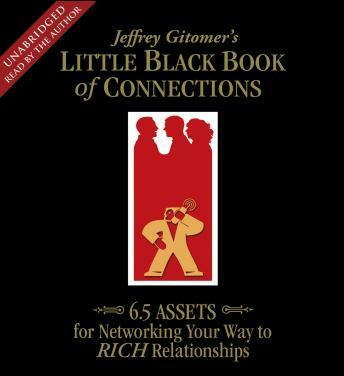 In Jeffrey Gitomer's Little Black Book of Connections you will find secrets uncovered, myths dispelled, and hundreds of ways to interact, connect, and score. You'll learn things like where to network for the best results, how to make the initial connection, how to capture the opportunity, and how to follow up so that you capitalize on the connections that you make. The Little Black Book of Connections is not just a sales guide, it's a business guide and a life guide. Gitomer's 6.5 Assets for Networking Your Way to Rich Relationships will get you from who you know to who knows you.